The cottage labeled Gites de France 2 ears of 80 m2 located on the hillside overlooking the village and offers a magnificent view. It can accommodate 6 people and a baby. internet access free wifi. On the ground floor is the living room with kitchen living room, lounge with TV, DVD and fireplace. Access onto the terrace with garden furniture, parasol and barbecue, covered sandbox for kids and two chairs. The bathroom has shower sink, hair dryer, washing machine and dryer. A baby bath, changing mat and high chair are available. Separate toilet. 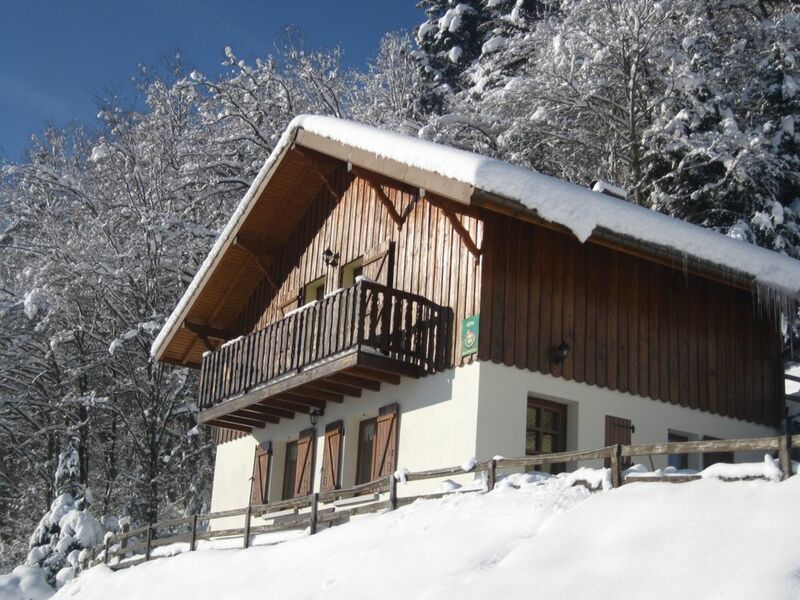 Upstairs 3 bedrooms, two with 140 beds, on a balcony overlooking the village and the mountains, overlooking the 3rd timber includes bunk beds 90. There is also a baby bed. Storage is provided for each room. the 2nd bathroom includes a shower and sink and hair dryer, separate toilet. The marked trails lead from on site in the forest. You will have sheets of marked trails, board games, DVD about the area, books to enjoy your evenings. Outside plot of common games to other cottages with house child swings, skittles, balls, Molki, darts to the delight of children and adults. benches at various locations allow you to admire the beautiful views of the village and mountains. Chalet très bien situé ! Reçoivent tous les locataires autour d' un verre en fin de séjour ! Sehr schönes Häusschen am Hang mit wunderbarer Aussicht übers Tal. Sehr sauber, gemütlich, geräumig, gut ausgestattet! Très satisfaisant pour nous de savoir que le séjour vous a été agréable. Le beau temps y a contribué et permet d'appécier le paysage et de profiter de belles soirées. Nous avons passé avec les enfants un sejour tres agreable. La vue est superbe, et la situation du chalet est ideale. Les pieces sont aussi tres agreable. Le soir en terrasse les repas sont tres agreable. Nous recommandons fortement ce nid tranquil et douillet. Vous avez apprécié notre chalet et village. nous en sommes très heureux. C'est super de savoir que vous avez passé un bon séjour chez nous. Le beau temps a apporté sa contribution. For walkers, many marked trails lead to the top of the village and offer multiple points of view and in the whole region. Tours are available at the cottage. For longer trips the car will be necessary and will complement your findings to Gerardmer and its lake 25 km, the ridge road, the Ballon d'Alsace, the region of a thousand lakes, Alsace.